Inspired by the classical architecture of Andrea Palladio, this Italian villa was designed with a procession of beautifully proportioned, ordered spaces, with strong axial sightlines, to draw the eye through the spaces and beckon the individual to explore. Beautifully sited on acreage, the interior and exterior spaces are thoughtfully orchestrated to interact together, and to connect to the land. Stone loggias, at the entry, rear, and side of the residence, visually and literally extend the interior living spaces. View-lines extend through the house from the open courtyard and infinite landscape vistas of the front to the wooded terrain of the rear. Gentle cross-breezes flow and natural light streams into the rooms from a series of French doors lyrically arranged throughout the spaces. 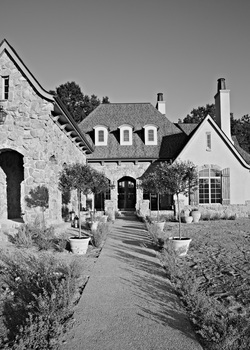 The exterior of the home was inspired by the enduring farmhouse villas of Tuscany. Rustic Cortona stone defines the unifying tripartite arches of the loggias and the austere beauty of the architectural lines. The design concept was to juxtapose the rugged austere exterior with the elegantly relaxed, exquisitely refined interior spaces, for a pleasing balance. Varied textures, patterns and patinas create visual interest throughout the architectural composition. The scale of the home, and the beautifully proportioned and decorated spaces that comprise it, are immensely functional, comfortable and livable inspiring a “La Dolce Vita” lifestyle. "Evoking the romantic, classical villa style of the past, this home is an artful composition." With the most votes, this inviting European-style home takes first! Tuscany is one of Italy's best-loved regions, and for good reason! The beautiful countryside is home to a rich artistic heritage that includes exquisite art and architecture, excellent vineyards, and delicious food. ​All of those heavenly attributes were undoubtedly on the minds of the builders, architects, and designers when they crafted this Italian villa-inspired residence, which took top honors in our annual Readers' Choice/ Best Overall Home category (it also won in several other Detroit Home Design Awards categories!). "It's a work of art for everyday living," says John VanBrouck, president of Birmingham-based VanBrouck & Associates. 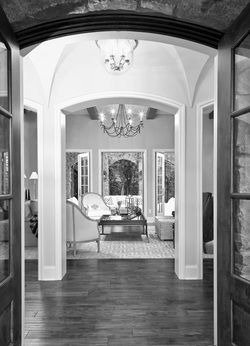 Inspired by the classical architecture of Italian villas and designed by VanBrouck with Olde World Homes of Birmingham and Oliver Max Interiors in Birmingham, this luxury home in Bruce Township features a procession of beautifully proportioned spaces with strong axial sightlines that draw the eye through the home. 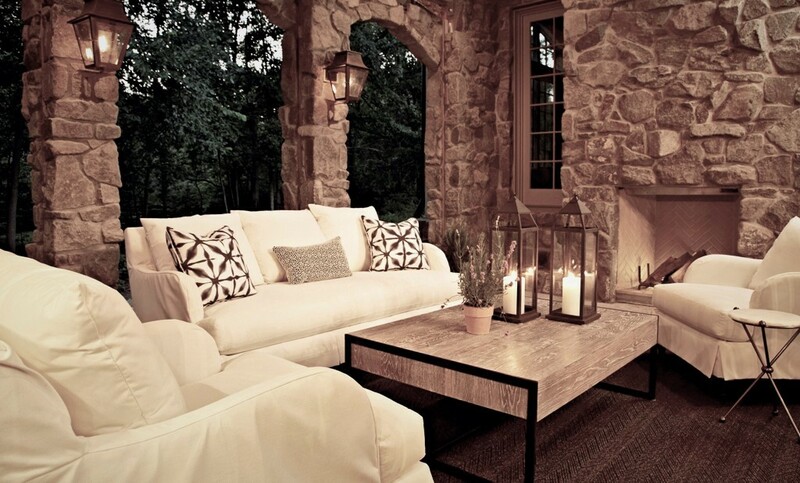 Especially appealing is the way the interior and exterior areas interact. Stone loggias at the entry, rear, and side of the residence visually and literally extend the interior living spaces. Cross-breezes flow through the living areas, and natural light streams in through French doors that are lyrically arranged. ​The enduring farmhouse villas of Tuscany inspired the exterior, which is constructed of rustic Cortona stone. The designer explains that his goal was to juxtapose the rugged austere exterior with the elegantly relaxed and refined interior. Of note: an original Richard Bogart oil painting above the fireplace; a quiet color palette of furnishings; a wide range of varied textures, patterns, and patinas; and a well-thought-out scale in design (making the home functional, comfortable, and livable at once). The design concept was to create an open plan, enabling expansive views of the lake from all the primary rooms, with a stone veranda stretching more than 50’ along the lakeside of the home to provide a sheltered, shady haven to relax and entertain. 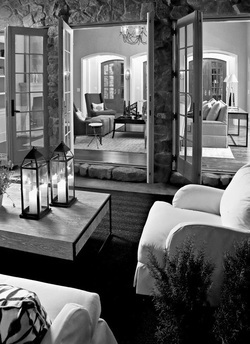 Pairs of French doors and an abundance of windows allow a profusion of natural light and lake breezes into the house. ​A soothing monochromatic color palette is used throughout the interior to unify the spaces, and create a quietly elegant ambiance. ​Unifying design elements, such as the stately French-cut limestone range hood in the kitchen that complements the French-cut limestone fireplace surround in the adjoining living room, are mindfully orchestrated to create cohesion in the open plan. 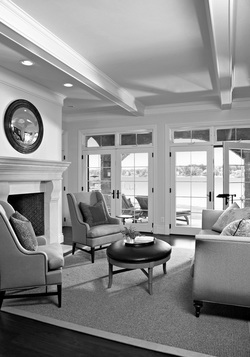 Furnishings are refined, comfortable and carefully edited to allow views of the lake to take command. Stone loggias, at the entry, rear, and side of the residence, visually and literally extend the interior living spaces. View-lines extend through the house from the open courtyard and infinite landscape vistas of the front to the wooded terrain of the rear. ​Gentle cross-breezes flow and natural light streams into the rooms from a series of French doors lyrically arranged throughout the spaces. ​The design concept was to juxtapose the rugged austere exterior with the elegantly relaxed, exquisitely refined interior spaces, for a pleasing balance. An exquisite original oil painting by Richard Bogart, which hangs above the limestone fireplace in the central living-room space, sets the quiet color palette and ambiance for the beautifully edited, restrained furnishings of the home. This classic, traditional Shingle-style home was strikingly transformed from an outdated 1950’s production ranch-style home, with a complete renovation of the entire first floor and an entire second floor addition. The result is a completely updated home with an open, functional floor plan with classic, timeless architecture. Adherence to authentic Shingle-style design elements were carried throughout the exterior of the home as well as throughout the interior detailing and material selections for a classic elegance. The façade of the home features shake siding above the original brick base, groupings of mulled double-hung windows, playful steeply-pitched gable rooflines, bracket detailing at the multi-level eaves and a large front-entry porch with classical columns. The 2-story foyer entry is light and welcoming and features beautiful, traditional white-painted millwork panels with an elegant staircase which wraps around the entry space to an unexpected and charming second floor reading loft that overlooks the entry. Beautiful, classic white-painted millwork is carried throughout the home with the deep coffered ceiling in the sunroom, a Shingle-style mantel and surround of the fireplace in the breakfast dining, the cubby lockers in the mud hall and throughout the trim work of the house. White Shingle-style cabinetry is installed in the kitchen and butler’s pantry and hand-scraped, dark-stained walnut floors flow throughout the rooms to integrate the spaces. ​Beautiful large groupings of windows capture views of the lush lawns and mature trees surrounding the home and allow natural light to flood into the rooms to create a connection with the outdoors. An outdated 1950’s production ranch-style home was completely transformed into a classic, traditional Shingle-style home with this addition project, which involved an upper-level addition and enlarging the main-level kitchen, sunroom and garage spaces. 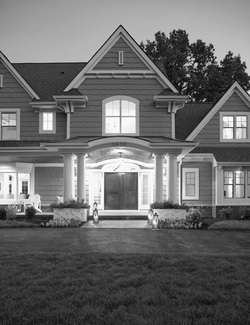 A new mud hall with a side-entry porch was added and the entire first floor was extensively renovated, while the entire façade of the home was redesigned in a classic Shingle-style. 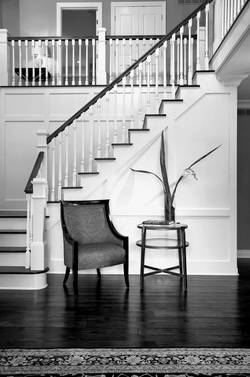 The new two-story entry foyer features beautiful, traditional white-painted millwork panels and a refined stairway which wraps around the entry space to an unexpected and charming second floor reading loft that overlooks the entry. It is welcoming, yet exquisitely restrained, and immediately captures the understated elegance that continues throughout the home. The new second floor houses an exquisite master suite with a chic, spa-retreat bathroom, generous his-and-hers walk-in closets, two large additional bedrooms with a spacious bathroom, a large second-floor laundry and a playroom above the enlarged garage. 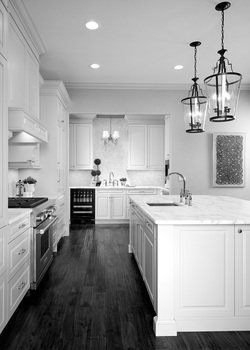 The expanded kitchen was completely updated consistent with the Shingle-style design with custom white cabinetry and hand-scraped, dark-stained walnut floors that flow throughout the home to integrate the spaces. It is open to the expanded sunroom space which features a beautiful 12-foot coffered ceiling with stacked windows on two sides of the room. 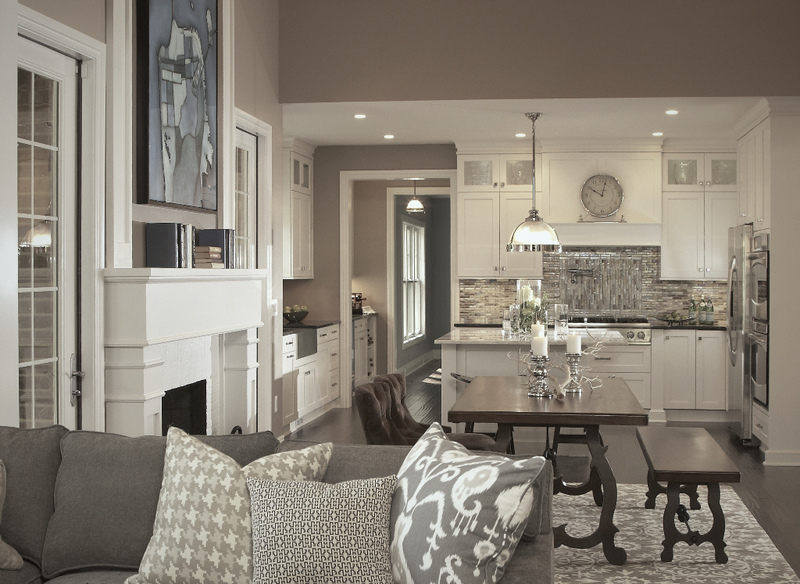 A coastal Cape-Cod-inspired soft and neutral color palette was selected for its sophisticated, calming ambience. This lovely, whimsical gardener’s potting shed was designed to be a charming place to pot plants, play in the garden, and display collections of potting containers, birdhouses, tools and other garden relics to create a gardener’s paradise. It is nostalgic, designed to evoke childhood memories of carefree summer days. Designed with an old-world French Country aesthetic, it is also a beautiful piece of architecture. The potting shed becomes an integrated architectural feature of the house, connected to the main house with a sweeping, charming stone wall, and is beautifully proportioned to balance the scale of the main house. The steeply-pitched copper hip roof, with flared eaves, sports a decorative finial, and is consistent with the overall French eclectic architectural style. 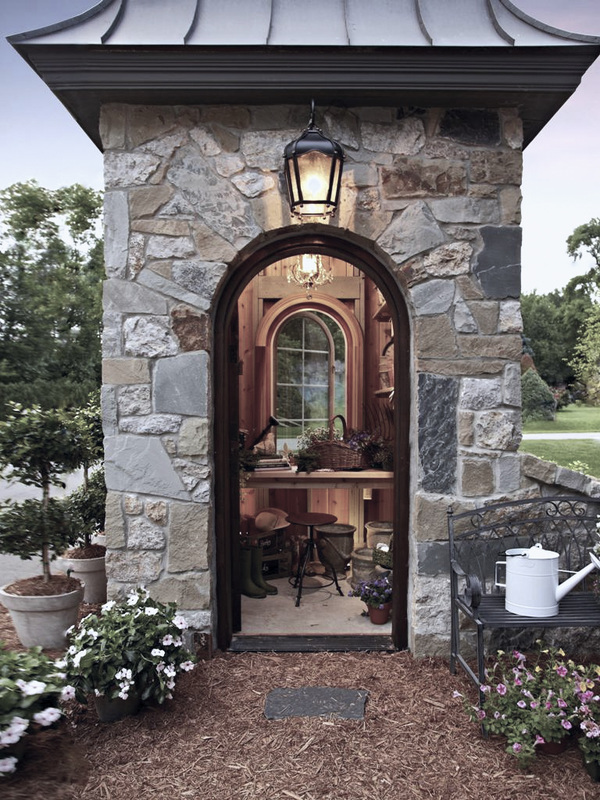 Connecticut fieldstone was selected for the all-stone main house for its subtle, varied palette of soft gray and buff colors and its beautiful texture, and is thoughtfully continued on all facades of the potting shed to lend it an elegant, enduring stature. ​A whimsical alder wood Dutch door adds character, while a radius-arch casement window opposite the door opens to allow cross breezes to flow through the space. An elegant, vintage crystal chandelier is unexpected, and juxtaposes with the natural vertical-plank pine wood interior walls and shelving, the gray painted exposed stud framing and the rustic honesty of the heavily patinaed potter’s stool and other weathered crates and containers. ​Inspired by the classical architecture of Andrea Palladio, the exquisitely elegant entry-hall foyer of this Italian villa home sets the theme for the architecture of the residence. It is a beautifully proportioned ordered space, described by three perfect, sculptural groin vaults, which reach upward to the sky. It transitions the exterior landscape with the interior spaces, and stretches laterally along the main core of the house, linking the private north wing with the outstretched south wing, which houses the secondary bedrooms and utility spaces. A beautifully edited vignette, showcasing an antique Empire chest, draws the eye to one end of the gallery space, while on the opposite end a glimpse is offered into the chic, formal powder room. ​The foyer introduces the design concept of three parallel axes that trisect from the entry loggia, through the core of the living space, and out through the rear exterior loggia. 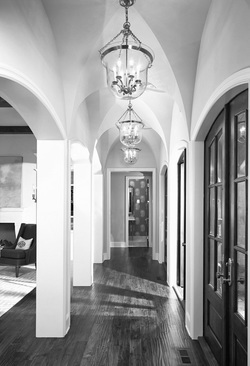 The foyer space is defined by the three arches that frame the view into the living room, and the three beveled-glass-paned mahogany entry doors, each set on-center with the three groin vaults. The elegant glass entry doors, in turn, are placed on-center with the tripartite rustic Cortona stone arches that form the entry loggia. ​Natural light floods into the interior spaces. The view outward is through the loggia, into the intimate stone courtyard, and out to the nearly endless, magnificent Tuscan-like landscape beyond. The heavy, rustic stone that forms the exterior walls is juxtaposed with the refined, sculptural foyer space, creating a striking balance. This intimate, comfortable and stylish outdoor screened living porch was designed for relaxing and enjoying the expansive views of the lake, boat dock, and backyard and the calming breezes that blow off the lake. The soothing monochromatic color palette of linen, with misty grays and soft blues that take their cue from the lake, create a peaceful, ethereal feeling and are consistent with the understated, elegant interior rooms of the home. 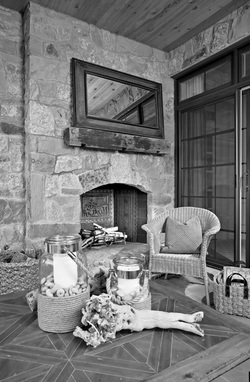 The two exterior “walls” of this space are created by floor-to-ceiling, one-piece retractable screens, designed to vanish into the soffit above, while the two interior walls that abut the house are constructed with Connecticut fieldstone that sheaths this all stone home. The stone wall on the south side creates the façade of the masonry fireplace. A reclaimed, rustic thick wood beam was selected for the mantle. ​The floor is Pennsylvania bluestone, while the ceiling is cypress wood plank board. While the space is furnished to resemble an interior living room with comfortable slip-covered upholstered furniture, it is finished in durable exterior linen sailcloth fabric to withstand the exterior weather. The varied patinas, tones and textures of the architectural elements and the interior furnishings add visual interest and charm. The natural changing light from the lake is supplemented at night with candlelight, firelight, and overhead lighting on dimmers. This room has direct access to both the living room and media room, and flows to the backyard. The screened rear loggia of this Italian Villa residence stretches along the length of the main living room to literally extend the interior living space and visually continue the axial procession of space that begins at the front-entry loggia and continues through the entry-hall foyer, living room, and out through the rear loggia. The loggia is accessed off the living room by three pairs of French doors that mirror the three pairs of entry doors in the foyer, to create a perfect, symmetrical cross-axis through the home. The exterior walls of the loggia space are defined by heavy, rustic Cortona stone arches, placed on-center with the French doors. 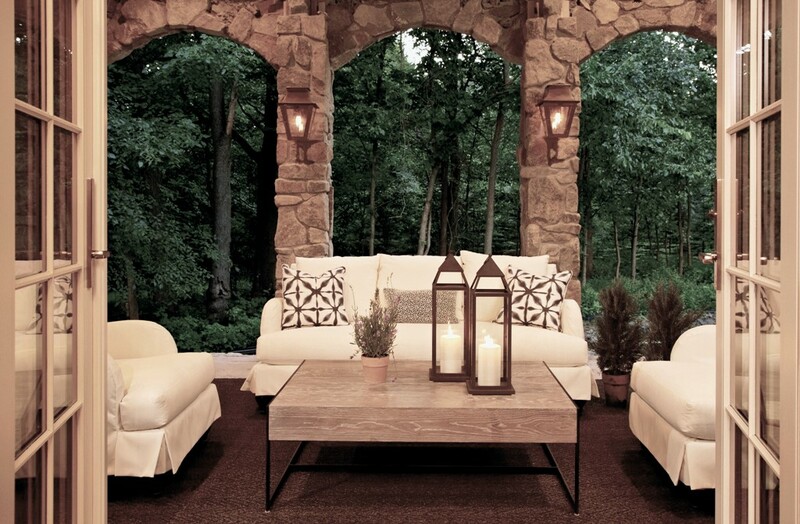 They mimic the front-entry loggia arches and frame the forested landscape that encircles this intimate outdoor room. Retractable screens, installed between the arches, are designed to disappear into the soffits above. While the rear yard is private, sightlines through the house and front courtyard are expansive, allowing vistas of the Tuscan-like landscape that stretch for miles to be viewed from the rear loggia. The interior and exterior spaces flow together seamlessly. The Cortona stone continued on the masonry fireplace and the walls that abut the house, along with flickering gas lanterns, create a romantic Tuscan ambiance. The rustic architecture is juxtaposed with comfortable, elegant furniture that was selected to cohesively flow with the elegant adjoining interior spaces. A dark sisal rug anchors the room and creates a pleasing contrast with the white slipcovered Henredon furniture and quiet monochromatic design of the space. This exquisitely restrained kitchen, located directly off the main core of rooms in this open-plan Italian villa home, was designed to extend the classically refined and elegantly relaxed style of the adjoining living room and entry-hall gallery spaces. The kitchen design continues the principle design concept of the home to create a beautifully balanced procession of living spaces, with axial sightlines through the spaces, to relate to each other and the surrounding landscape. 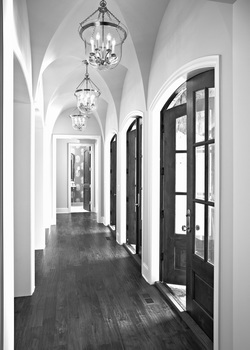 Classic symmetry is also thoughtfully designed through and within all of the spaces. A perfect symmetry is orchestrated through the core of the kitchen with the tranquil, blue-grey, fine Swedish-furniture cabinetry panels of the refrigerator perfectly mirrored with the paneled food pantry, each bookending the upper cabinets and vent-hood centered above the Wolf cooking range. The symmetry is continued with the kitchen island and main prep sink perfectly balanced with the range wall and the adjoining casual dining room. Two finely patinaed iron chandeliers are centered above the island, their scale giving balance to the space, while the translucent seeded-glass retains the airy restraint of the design. 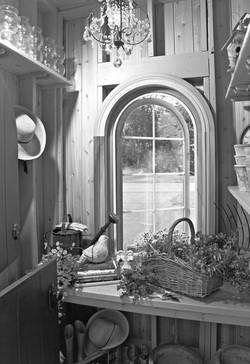 A “butler’s pantry” prep area is placed in an alcove off the main core of the kitchen. It houses a second prep sink, oven, wine refrigerator, built-in cappuccino maker and additional cabinet storage. Exquisitely grained carrara marble is installed on the island and counter tops and is tastefully complemented with the delicate pale grey and white tiles of the mosaic backsplash. Dark-stained, hand-scraped walnut floors anchor the soft monochromatic room and flow into the adjoining spaces. This charming, casual dining room, which adjoins the elegant, refined kitchen in the open plan of this Italian villa residence, is framed by exquisitely paneled, painted millwork walls, creating a separation between the spaces. The millwork panels replicate the elegant, tranquil blue-grey, fine Swedish-furniture style cabinetry in the adjoining kitchen for a pleasing visual continuity. 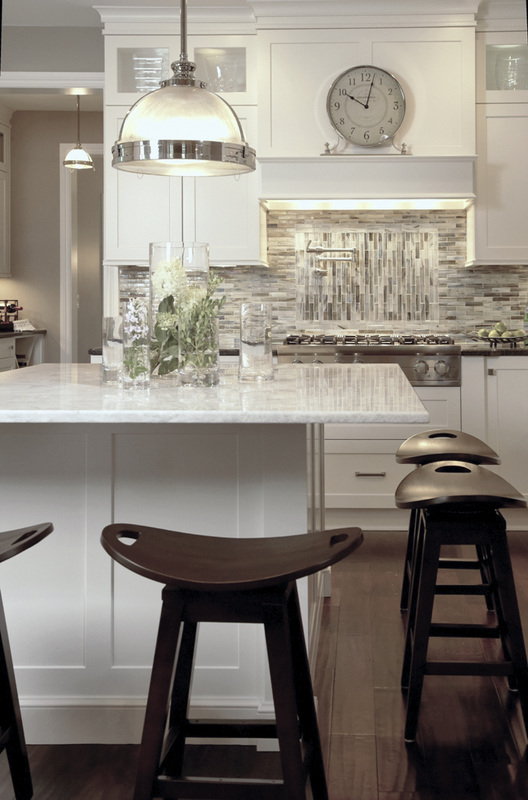 The spaces are beautifully proportioned and ordered, with the dining space placed perfectly on-center with the island and symmetrical design of the cabinetry on the opposing kitchen wall. ​The dining room is enveloped with multi-paned windows and a pair of French doors, which lead to the rear loggia, enabling natural light to dapple into the space. Expansive views of the lush wooded landscape, which stretch for miles on the property, connect the architecture with the land, and create a private, serene oasis. Dark-stained, hand-scraped walnut floors anchor the room and flow into the adjoining interior spaces. The color palette is quiet, evoking a romantic ambiance. Visual interest is created with the varied patterns, patinas and textures of the furnishings. Urns of fresh rosemary, and a collection of topiary herbs, recall the Italian landscape, and add an aromatic sensory layer to the spatial experience. This enchanting, whimsical gardener’s potting shed was designed to be a playful and functional place to pot plants, and to arrange freshly cut flowers from the garden. It is a charming place to store and display the owner’s collections of potting containers, birdhouses, tools and other garden relics to create a gardener’s paradise. It is nostalgic, designed to evoke childhood memories of carefree summer days. An elegant, vintage crystal chandelier is unexpected, and juxtaposes with the natural vertical-plank pine wood interior walls and shelving, the gray painted exposed stud framing and the rustic honesty of the heavily patinaed potter’s stool and other weathered crates and containers. A whimsical alder wood Dutch door adds character, while a radius-arch casement window opposite the door opens to allow cross breezes to flow through the space. 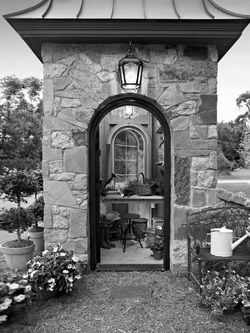 ​The potting shed structure becomes an integrated architectural feature of the house, connected to the main house with a sweeping, charming stone wall, and is beautifully designed and proportioned to balance the French eclectic architectural style and scale of the main house. ​Connecticut fieldstone was selected for the all-stone main house for its subtle, varied palette of soft gray and buff colors and its beautiful texture, and is thoughtfully continued on all facades of the potting shed structure to lend it an elegant, enduring stature. 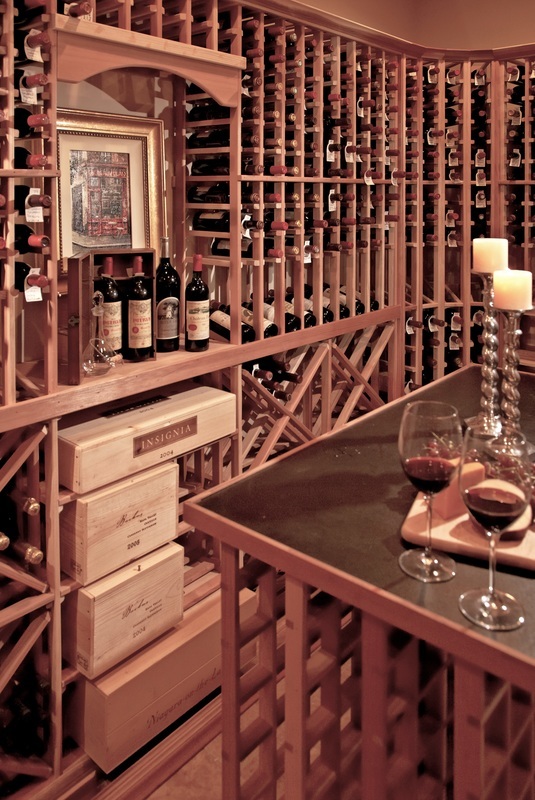 This exquisitely designed and detailed wine cellar was inspired by the owner’s joy of collecting, displaying and enjoying fine French, Italian, and California wines and love of classic, traditional English-pub architecture. ​The design concept was to blend state-of-the-art storage/ racking and climate/ humidity control systems with subtle suggestions of Anglophile design style. The ambiance of the wine cellar is refined and elegant, while taking design cues from the adjoining wine tasting and English-pub style darts and billiards spaces. Distressed knotty alder wood doors and sidelights, which open to the wine cellar, feature multi-paned leaded art glass. It also features beautiful wrought iron roping detail outlining the open diagonal storage bins and an exquisite pebbled leather top and drawer to provide a place to display and store sommelier tools. The warm tone of the tongue and groove redwood ceiling and redwood racking system is complemented with the cool grey tones of the natural slate floor. ​The varied textures, tones, and patinas of the stone, wood, leather, iron and art glass add visual and tactile interest, adding to the overall sensory experience and pleasure of tasting fines wines. An extensive redwood racking system was designed to wrap this sizable 16’x10’ space to provide ample storage and safekeeping of cases, as well as, bins, display and single-bottle racking storage. A state-of-the-art electrically controlled temperature and humidity system maintains and protects the collection. 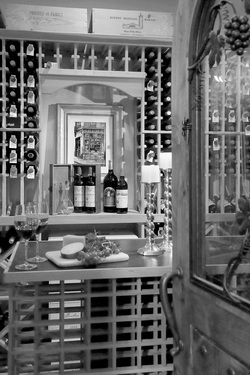 An uncorking and decanting alcove is placed on-center with the knotty alder wine cellar door that features an iron grape design on seeded art glass. The tasting island in the wine cellar provides a place to sample wines while surrounded by the collection, while also providing extra storage. 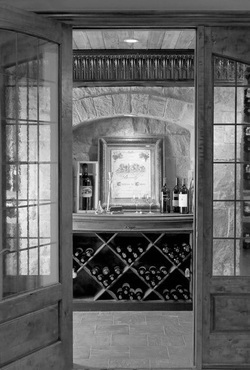 An adjoining wine tasting room, with heavy thickened stone and plaster walls, and a groin-vaulted plaster ceiling, reminiscent of the underground wine caves of French castles, provides a comfortable, heated space to linger and savor private wine tastings, often paired with simple or multi-course gourmet meals. ​A tumbled French limestone floor flows throughout the wine cellar and wine tasting room to unify the spaces. ​The same furniture-quality, misty-gray glazed, hand-rubbed Grabill cabinetry that is installed in the kitchen is installed in the back hall to cohesively integrate all of the spaces in the home. ​Large-sized cubbies with hooks to hang coats are paired with bottom drawers and complement the built-in cabinet chest with multiple drawers to organize gloves, scarves, sweaters, and sweat shirts. The pewter-gray granite counter top provides a place to drop keys, cell phones, and a purse. Large baskets store off-season clothing and sports equipment. There is direct access to the covered stone veranda, barbeque, backyard and boat dock through a French door that also enables natural light to flood into the space. A glass-front subzero refrigerator and ice-maker are fully integrated into additional storage cabinetry nearby to service the veranda and barbeque. Direct access to the garage is attained through a small vestibule that opens off the mud hall, which also accommodates the back-stair that leads to the second floor bedrooms. ​An elegantly appointed second powder room on the main floor is located directly off of the space for convenient access from the veranda and lake. A marble floor flows through the mud hall from the adjoining spaces. Oil-rubbed bronze hardware and a pair of Moravian star light pendants complete the stylish design.